Every year, on behalf of the council, Resource Futures undertakes a compositional analysis of residual waste to understand what residents are throwing away in the black bins. The latest analysis was conducted in September 2015. A total of 269 households were included and the sample was stratified by council tax band. The sample size is a representative proportion making the results around 95 percent accurate within 8 percent either way. Households are contacted in writing a few months before the sample is collected and have the opportunity to opt out. The sample households are not told when the analysis will take place. The waste is collected and sorted by hand into different categories before being weighed. The average volume of contents of the bins is 81 percent or 194 litres, based on observations made at the point of collection. Over the past five years kilogramme per household of residual waste has increased. The percentage of material that could be recycled has also increased while the authority’s overall recycling rate has been dropping. This shows that more recyclable items are being put into the black bin by residents, despite the wide range of items that can be collected as recycling. Food waste is the most significant within the biodegradable category at 23.1 percent. All of this could be recycled in the weekly kerbside food collection service. Over half of the food waste could have been avoided through good practice such as planning meals, watching dates and managing portions. Garden waste is 8.9 percent of the black bin and 28 percent of the biodegradable waste or approximately 3,993 tonnes. This has increased over the past two years from 2 percent in 2013 to 4.8 percent in 2014. This increase is most likely due to the introduction of a chargeable garden waste collection scheme in 2014. Miscellaneous waste was the second largest category at 25 percent and included nappies, animal waste, wood, renovation and DIY, batteries, engine oil, sanitary material etc. Nappies accounted for a large percentage of miscellaneous waste and made up 7.5 percent or approximately 841 tonnes of the total contents of the black bin. Plastics accounted for 17.5 percent of the black bin and included non-recyclable items such as black plastic and film. Around 23 percent or approximately 1,804 tonnes of the plastic was recyclable, mostly plastic bottles and PET. Paper and card made up 13.5 percent or approximately 6,057 tonnes of the black bin, with 42 percent being non-recyclable paper such as used tissue and kitchen roll. The remaining 58 percent could have been recycled and included newspaper, pamphlets, household paper and cardboard. Glass accounted for a small percentage of the waste stream at 2 percent or approximately 897 tonnes. The majority of it was clear glass. 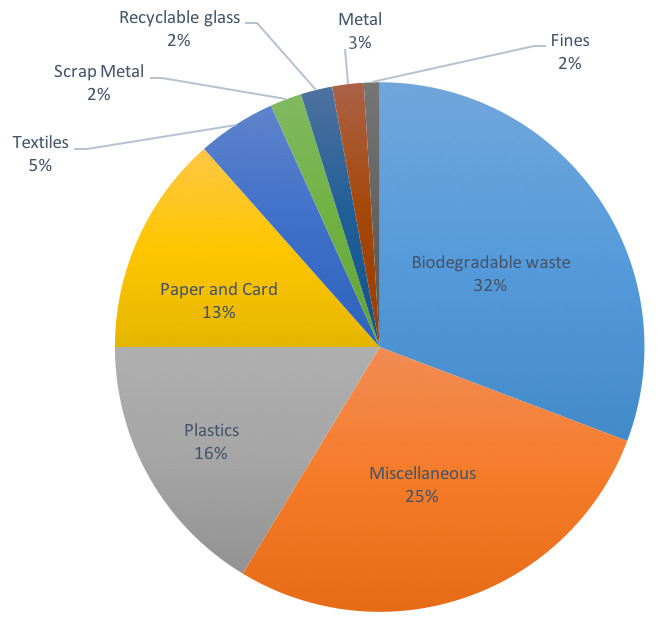 Metal accounted for a very small percentage of the overall waste stream only 1.7 percent, approximately 762 tonnes. The metal included steel and aluminium cans, clean foil and aerosols. In 2014-15 each household in South Gloucestershire generated 1,061kg of waste. The kilogramme per household of residual waste collected at kerbside was 397.2kg or 7.6kg per household per week. The compositional analysis by council tax highlighted that properties in bands A, F and G created higher than average waste arisings of over 9kg per household per week. Band F was the highest at 10.4kg per household per week and the lowest was band B properties at 7.8kg per household per week. A total of 52 percent of the contents of the average black bin could have been recycled in 2014-15 through the existing kerbside recycling service. This is equivalent to 23,331 tonnes. A further 10.1 percent or 4,531 tonnes could have been recycled through the Sort It recycling centres. In 2014-15 the council spent over £3m disposing of this recyclable material in the residual waste stream. The majority of this was processed into material used for energy production. The findings of the compositional analysis directly apply to the proposals in the waste strategy. There is significant scope to improve recycling in South Gloucestershire by diverting recyclable items from the black bins. The strategy reduces the volume of residual waste, encouraging residents to put recyclable items in their recycling containers. 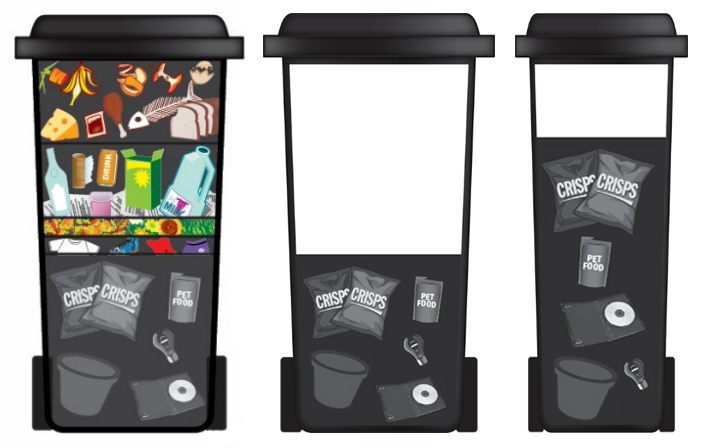 The analysis shows that a reduction of black bins to 180 litre would not have enough impact to change behaviour, making a reduction to a 140 litre bin essential to achieving our targets and the aims of the strategy.